8x8 Barge-Monitor-Whisper is an add-on service that helps office managers and supervisors to monitor phone conversations of employees on 8x8 PBXs with customers or others. Whether it is to ensure quality of customer service, coach new agents during a conversation, or interrupt a live call for an emergency, 8x8 Barge-Monitor-Whisper gives you flexibility. For more information, refer to the Barge-Monitor-Whisper User Guide. This option is available to you only if you have subscribed to the 8x8 Barge-Monitor-Whisper service. Barge permissions are provisioned to extensions at the time of ordering the barge service with 8x8. In Account Manager, these extensions show configurable barge permissions. Note: Barge permissions are granted to primary extension users only, which excludes extensions associated with call queues, ring groups, virtual extensions, or auto attendants. Ability to monitor all extensions within the PBX. Ability to secretly monitor and barge in on all extensions. Ability to monitor without entering voicemail password. Restrict or disable barge permissions for an extension through barge lists. A barge list specifies the extensions of agents whose conversations you can barge in on. Enable barge tone that alerts the agent about the barge action. Prevent misuse of barge by prompting for an access code. 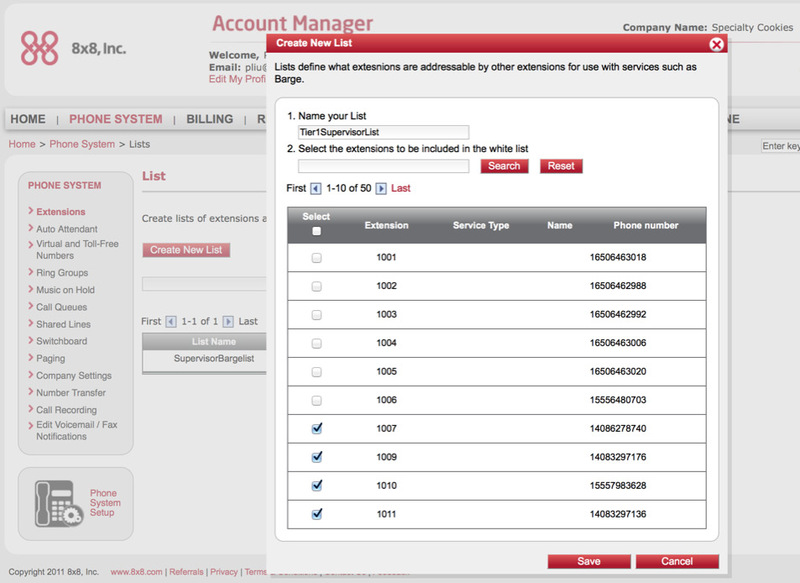 As a phone system administrator, you can select an existing barge list to monitor or create a barge list, enable barge monitoring tone, enable barge voicemail password, and select the extensions to be monitored. Click Phone System in the top navigation bar. On View All Extensions, click View. 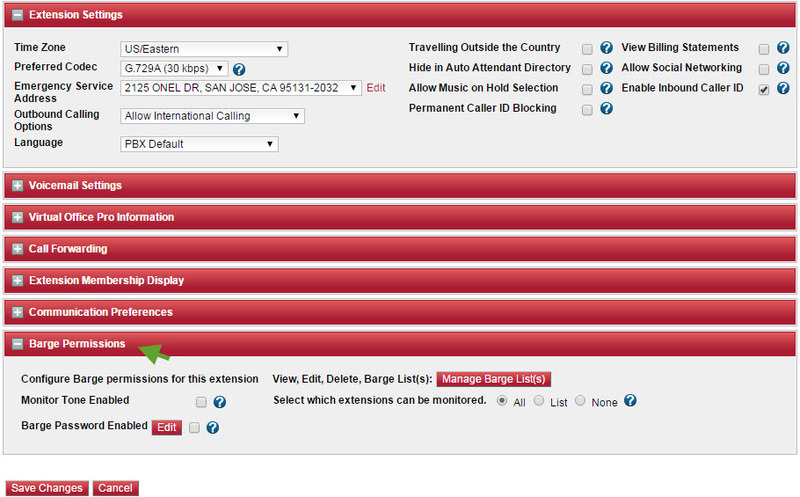 Select the extension you need to change barge permissions for. Click Edit to view the extension settings. Click to expand the Barge Permissions pane. Select or change the desired barge settings. If enabled, relays a beep tone to the agent, signaling a barge session. If enabled, prompts the supervisor to enter the voicemail password before beginning to monitor. Lets you create, manage, and delete barge lists. All allows barging in on all extensions. List allows barging in on extensions in a specific barge list. A barge list includes extensions which you can barge in on. You can create a barge list and assign it to an extension with barge permissions. It allows the extension user to barge in on extensions in the barge list. Click Phone System in the top navigation menu. Click Edit by the extension you wish to manage. Click Create New List. Name your list, and add extensions to barge in on.